Happy Monday! It definitely was NOT bare leg weather over the weekend… It was absolutely freezing in Chicago on Friday and Saturday, especially. It was kind of a rude awakening since we’ve had such a warm fall so far… I mean, I was in a cropped top last weekend at my friend’s outdoor birthday party. I think our ‘Indian Summer’ is finally over… It’s feeling like the 40’s are here to stay for a while. 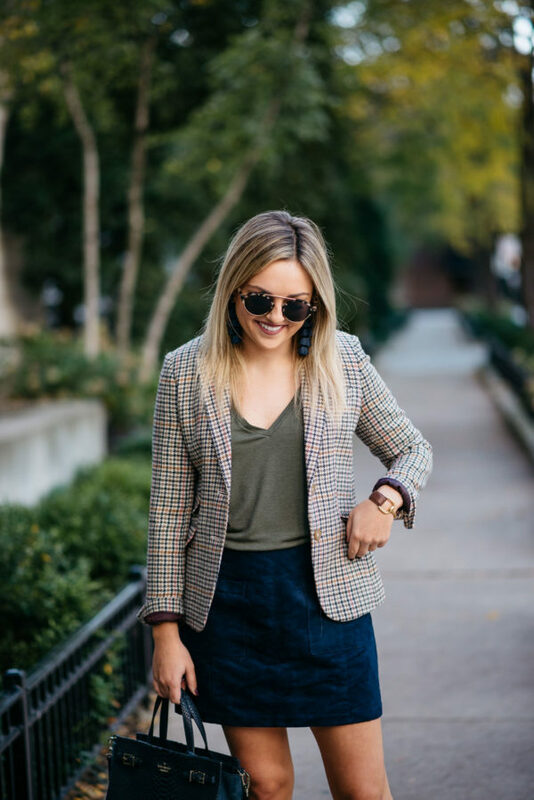 But if it happens to be warm where you are, hopefully you can take some inspo from this outfit I wore to a meeting the week before last! If you’re in my same boat with chilly weather, just pair with a chic pair of cropped trousers instead. If I was in a more corporate work setting, I would have opted for a chic tie-neck blouse and a more polished pair of loafers, but I was just meeting someone for a casual coffee so I kept it kind of lax with a tee and slip-on slides. How was your Halloween weekend?! I ended up having a much more lowkey weekend than originally planned… No Halloween celebrations for me, however, I could have played the part of a vampire without too much extra work. I woke up with pinkeye this past Thursday, but originally just thought it was allergies, or something with the weather changing so drastically last week. But by Friday evening, I knew something wasn’t right. I had taken my allergy medicine and while they didn’t really feel itchy, they were just slightly red and just felt dry. Since it wasn’t that severe, I still went down to Champaign on Saturday, but was just very cognizant about not touching my face, washing my hands or using hand sanitizer, etc. I woke up Sunday to full-fledged pink eye and went to the doctor right away… Picked up the prescription eye drops after so hopefully it clears up in a day or two! So let that serve as a little PSA/reminder about germs this time of year… Be extra mindful to always have hand sanitizer with you, wash your hands more often than you think you should, cover your mouth, etc. Let’s all stay healthy this year! 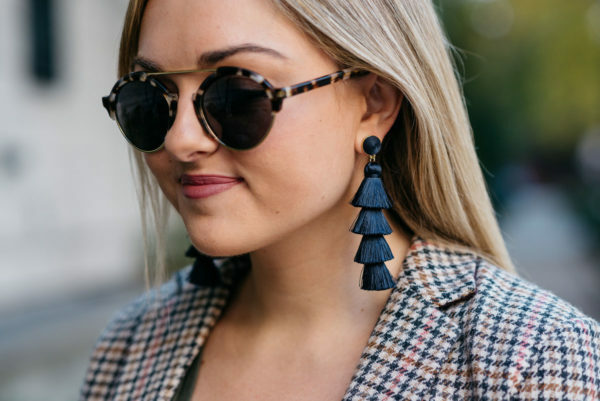 I just got these navy tassel earrings and I’m obsessed! You can wear them to work, or simply with a tee and jeans to take your look up a notch. I want them in every color. Great outfit as always – love those loafers!! 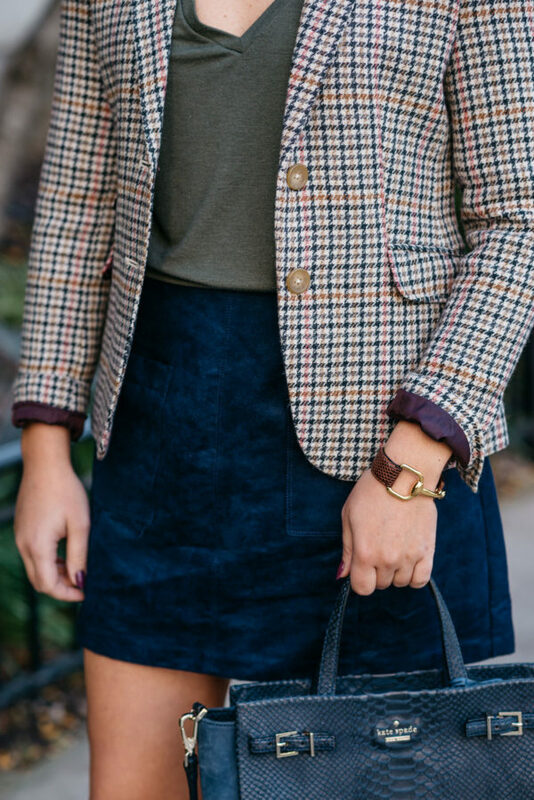 I have a similar blazer! I totally need to try styling it this way now. Thanks for the inspiration!